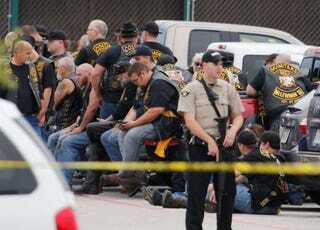 3 different biker gangs faced off in Waco, TX, earlier today. What began with fists escalated to chains and knives, and then to guns. Of course, the baddest gang out there - the cops - were already there, as talk about the impending fight was on social media even before it began. 9 people ended up dead, all of them gang members. Unbelievably, no innocent bystanders were injured.